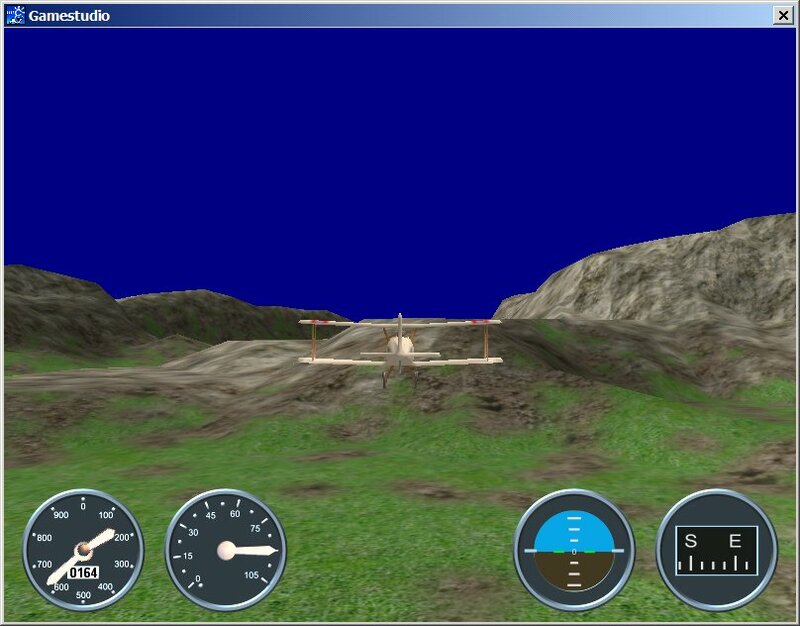 To start the flight level open the mainbuild29E.c file in the Script editor and press the Test Run button. SHIFT to deccelerate. This one also leads to landing. Arrow buttons to fly left, right, up and down. Button 2 to deccelerate. This one also leads to landing. This version uses shaders. You need the Commercial version of the 3D Gamestudio. Please use the version below in case you have a weaker version than the Commercial. The current alternatives are unfortunately not ready to use yet. 3D Rad 6 surely needs lots more time before you can make a game with it. It is under heavy constructions, which leads to nothing really useful at the moment. Beyond Virtual / Game Core, which was my other possible choice, also lacks in functionality at the moment. I better don’t start in 3D with a Pre Alpha Release. What’s left was the basic dialects. But that was not my stuff. And so i use 3D Gamestudio now. Anyway. Here comes a first screenshot of my current test level.